To start, Bali’s Ngurah Rai International Airport has been seriously upgraded. Flying in and taxing up to the airplane gates, I couldn’t see anything different. I had no idea anything had changed. But as soon as I stepped inside the airport I had quite a few surprises in store for me. Bigger, wider, newer hallways and a massive arrivals hall. Cleaner, more spacious modern bathrooms. It’s a new airport! Opened in late 2014. The new airport even has a duty free shop (of sorts) for the first time ever. But more on that later. First let’s talk about arrivals procedures. After all, that’s the first thing visitors to Bali must deal with. This long-standing & popular, one-month visa is still going strong. Visitors from 64 countries are eligible to simply arrive at any of Indonesia’s main ports of entry, including Bali, and pay for this one-month visa right there at airport immigration. But there are several minor changes in the VOA to note, as of 2014. Visitors can also pay by credit card! Step 1: Payment desk. Present your passport, pay $35 US or equivalent, and receive an official-looking VOA receipt. VOA applicants and people who arrive with Tourist Visas, Cultural/Social Visas and other visas (which they’ve already obtained at an Indonesian Embassy abroad) will all be mingled in lines together. This is a change from previous years when people arriving with visas were ushered to much shorter, quicker lines. At the immigration desk hand over all three documents and, hopefully, get your passport stamped with a 1-month VOA visa. VOA can be extended one time while in Indonesia, for another one month. This is the same as before. You must apply for the extension at an Immigration office in Indonesia well before your VOA expires. Alternately, hire a visa agency to handle it for you. Read my post How to Extend Indonesian Visas for full details. Technically, in order to receive a VOA at the airport, you must also have an ongoing flight out of Indonesia. In practice, the immigration officers rarely ask to see this. 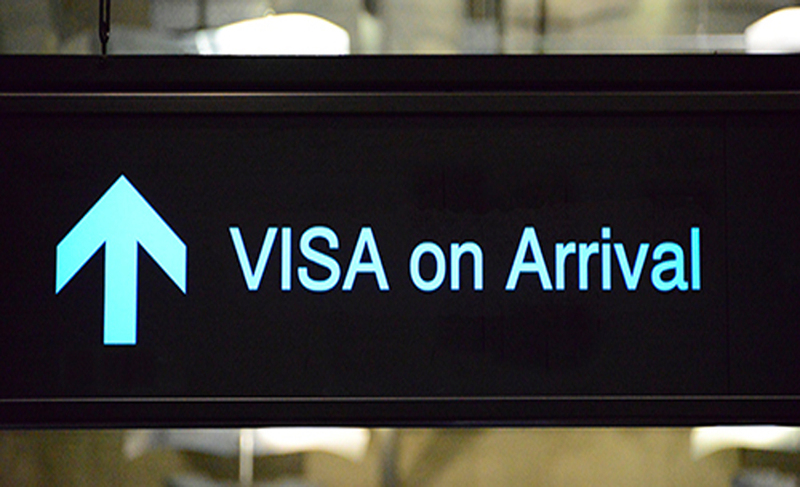 After all, you might want to extend your visa, so why should you have a flight already booked? And nowadays many flights are issued as e-tickets, which now means few people have any need to carry a paper ticket around. Customs procedures are the same as before. If you have nothing to declare, you simply walk through the green-signed customs line, hand an officer your pre-filled-out customs declaration and walk on through. For the first time ever, Bali’s airport has a duty free shop! But don’t get your hopes up. In fact, run the other way! I don’t think they understand the concept of ‘Duty Free’, which is supposed to offer goods at cheaper prices and without import taxes applied. Bali’s so called Duty Free shop is, instead, clearly trying to make a massive profit by attempting to sell goods at absurdly inflated prices. For instance, one liter of vodka, rum, gin or other spirits costs about $60-70 US! A normal bottle of sunscreen costs about $20-25 US! Those absurd prices are even higher than in mainland stores in ultra-expensive Australia and New Zealand. Apparently the long-standing taxi ‘mafia’ at the airport has finally been broken up. The airport now has at least two taxi counters where you can pay a fixed rate to any given destination in Bali. The prices are considerably lower than what you had to pay back in 2012 and earlier. Of course the usual mob of transportation touts are well on hand to pounce on new arrivals, offering highly inflated prices. Previously the taxi drivers just went in with this crowd, offering the same ridiculous rates. Now you can just ignore them all and head to the airport’s official taxi counter. Note – One taxi counter is located inside the arrivals hall, just beside the so called ‘Duty Free’ shop. Their posted rates are rather high. Instead, walk through the duty free shop and outside the airport. Head along the building to the right, ignoring all the taxi / transport offers, until you reach the outdoor taxi counter. Book your taxi there, pay and grab your cab. Flying in to landing I was astonished to see a highway curving its way right on top of a large shallow bay near the airport. From the air it looked as if it was sitting directly on top of the sea and must surely flood at high-tides and in storms. Asking around, I learned that it’s a new toll road running between Sanur and the airport / Nusa Dua / Uluwatu region. From the airport it’s possible to hop on the toll road to reach Sanur, Ubud and points further east and north (such as Candidasa, Padang Bai and Amed). The new road seriously detours a major chunk of traffic between the airport and the horrid Kuta-Legian-Seminyak sprawl. I’m sure it must be well worth using it in order to skip traffic. The new toll road to Sanur and Nusa Dua is10, 000 Rp for cars (under $1 US) and 4000 Rp (about $US 0.35 cents) for motorbikes. If you’re heading to Sanur, Ubud or areas east and don’t mind paying the extra toll fare, ask your driver to take that route. Must be cool to drive right on top of the water, too. Since my taxi went the original route, I also noticed that the traffic was not nearly as bad as it used to be. Apparently the toll road makes a difference. But there’s also another new road, which must account for the lighter traffic. From the first major round-about / statue that sits between the airport and Kuta, a new road runs underground! It bypasses the entire Kuta-Legian-Seminyak sprawl, taking vehicles out onto the main Kuta bypass. These two new highways seem to have significantly reduced the ridiculous traffic jams that were clogging up the area in previous years. That’s it for now on the recent and improved situation upon your next arrival into Bali.